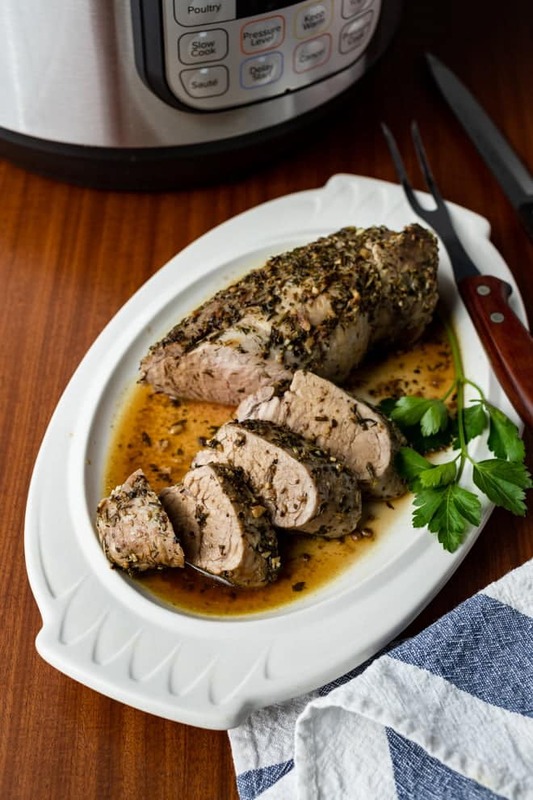 Pork tenderloin, not to be confused with pork loin roast, is one of my favorite cuts of pork. It’s the most tender of the cuts and it’s super lean making it a great nutritional choice. It also means that it can go from perfectly done to overdone and tough in a matter of minutes. And therein lies the problem. 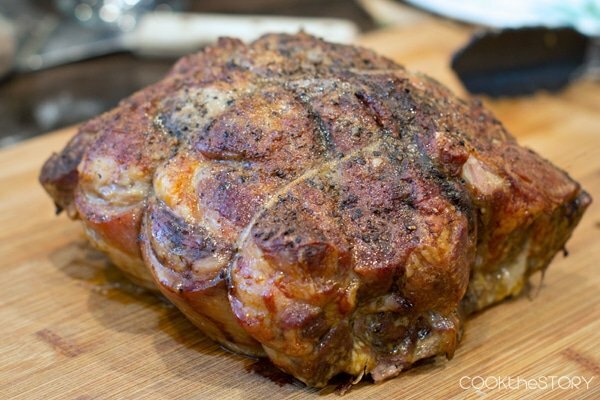 When using standard methods to cook this cut, it tends to need constant babysitting while it cooks. And honestly, sometimes my ability to devote undivided attention to anything after 4:30 PM is beyond taxed. 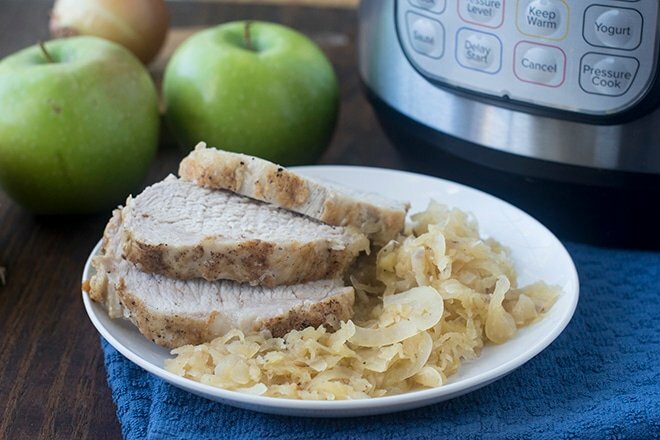 Once again, I turn to the Instant Pot to help solve the attention deficit and get a properly cooked pork tenderloin on the table. First, I don’t want you to be confused by the amount of cooking time that is used for the pork tenderloin. One (1) minute is correct. The heat from the pressurizing stage and the natural release stage will cook the pork. 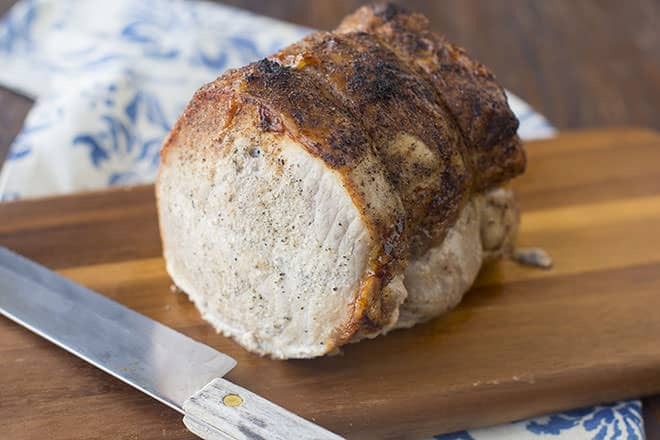 If your pork tenderloin is thicker than 1 1/2-inches, you will need to add about 3 minutes for every 1/2-inch of thickness. Like many of the recipes that rely on an internal temperature to ensure doneness, I recommend using an instant-read thermometer. The National Pork Board recommends cooking pork tenderloin between 145˚F and 150˚F for medium rare which is my preferred doneness for this cut. It has reached a safe temperature and stays tender and juicy. 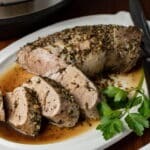 The garlic herb rub creates a very flavorful cooking liquid that I reduce down and serve over the tenderloin slices and garlic mashed potatoes. Simple, fast, delicious. Everything that an overly-scheduled parent needs at dinner time. In a small bowl, combine the garlic, salt, parsley, rosemary, thyme, and pepper. 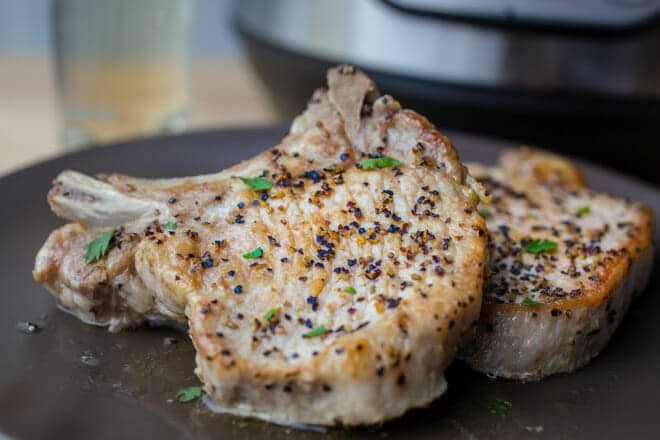 Rub 1 tablespoon of the olive oil on the pork tenderloin and then season with the garlic seasoning mix making sure to cover all sides. Add the remaining tablespoon of oil to the inner pot of the Instant Pot and select SAUTÉ to pre-heat. When the indicator says HOT, add the tenderloin to the pot and brown on all sides, about 2 minutes per side. Transfer to a clean plate. Add the broth to deglaze the pot, scraping the bottom to loosen all of the bits. Place the tenderloin back into the inner pot. Close and lock the lid. Make sure the steam release handle is in the sealed position. Select Pressure Cook and cook on high. Set 1 minute of pressure cooking time. When time is up, naturally release for 15 minutes. Turn the steam release handle to the venting position to release any remaining steam. Unlock the lid and open carefully. Check the internal temperature with an instant-read thermometer. It should read 140˚F. If it is more than 5˚ lower, close the lid quickly and allow the residual heat to bring up to temperature, about 3 – 5 more minutes. Remove the tenderloin to a cutting board and allow to rest for 5 minutes before slicing. While the tenderloin is resting, turn the Instant Pot to the SAUTÉ function and reduce the pan juices by about 1/2. After the tenderloin has rested for 5 minutes, slice and serve with pan juices or gravy.